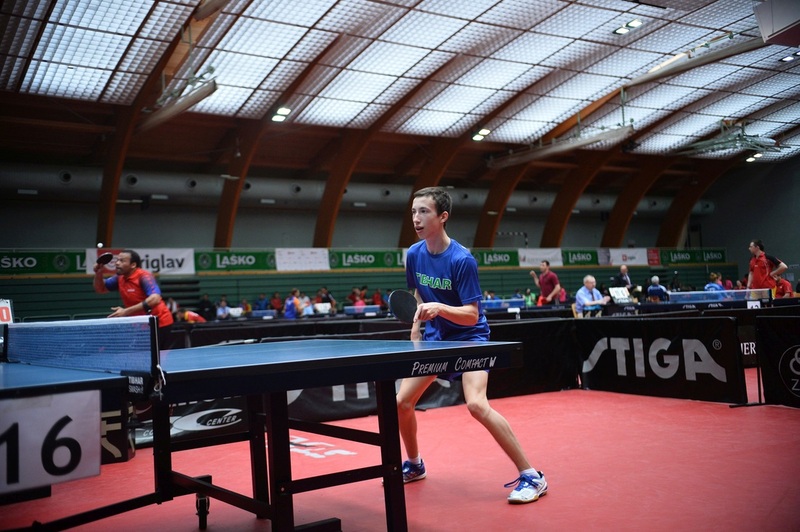 Yesterday marked the end of the successful 14th Slovenia Open Thermana Laško, which is considered the biggest para table tennis tournament in the world. 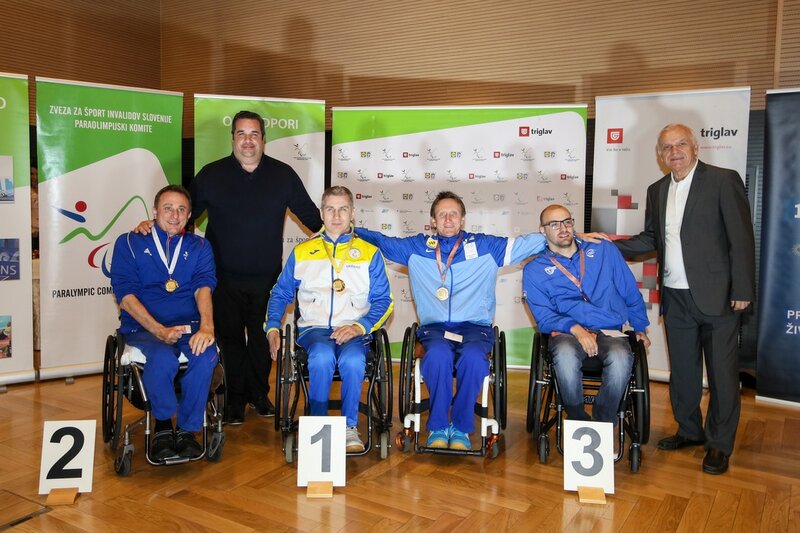 The organizing team – Sports Federation for the Disabled of Slovenia (Paralympic Committee) and Slovenian Table Tennis Association – once again did not disappoint. 323 athletes from 41 countries took part in the competition. The tournament was an important practice for the World Championship of doubles, that will take place in Slovakia next week. It was also an important test for the organizing team, who has taken over the organization of this year's European Championship, that will take place between 26th September and 5th October in Laško. Medals were awarded at the ending ceremony by the Deputy Major of Laško Jože Senica, board member of Thermana Laško Mojca Leskovar, the President of NPC Slovenia Damijan Lazar, technical delegate Constantine Crotta, legend of table tenis Edvard Vecko, coach of the British team Gorazd Vecko and by international referees Matija Krnc and Cyril Sen. Dance Club Zebra and singer Aleksander Novak entertained competitors and other guests at the ceremony. The event was hosted by stand-up comedian and swimmer Aleš Sečnik. The tournament also introduced a novelty – the most notable athletes, Spanish Alvaro Valera and Ukranian Oleksandr Yezyk, received a gift certificate from Thermana Laško. „We can be pleased with the implementation, the tournament was carried out without bigger problems. There were some minor difficulties, but they didn't affect the organization and athletes. This is an excellent basis for upcoming European Championship, which will be hosted in autumn in Laško,“ said the President of Sports Federation for the Disabled of Slovenia – Paralympic Committee Damijan Lazar. „We witnessed excellent matches, competitors made some progress in their games. I'm happy that once again we had optimal terms for the achievemnt of good results at high level. We are also working on the recognition of the tournament. Slovenian commercial television POP TV reported about the tournament for the first time, there were also reports on Sportklub, TV Celje, ŠKL TV and we were once again supported by Slovenian national TV. For comparison: two weeks ago Otočec hosted Pro Tour tournament and media did not pay any attention. We can be proud that such a little town of Laško hosted 323 competitors from 41 countries. This is a big deal!“ clearly stated the director of the tournament Gorazd Vecko. There were no big surprises, especially in doubles. Credits for the best Slovenian result go to Bojan Lukežič who managed to break through to the quarterfinals in singles. „My goal is always to be the best at the tournament with the highest quality factor – in Laško the factor is 40. We won and this is a good basis for the upcoming World Championship in Slovakia,“ said Brasilian player Danielle Rauen, who won doubles with Bruna Costa Alexandra in SF10. „I love returning to Laško and this impeccably organized tournament. We were once again successful. Gold medal in doubles is a great motivation before World Championship in Slovakia. Honestly – the tournament was a good preparation for the upcoming championship,“ added Serbian player Borislava Perić Ranković, who won doubles with Nada Matić in SF4. The last day of the tournament was marked by the upcoming European Championship EPINT 2017, which will be hosted in Laško between 26th September and 5th October. All of the visitors of the press conference agreed that this will be a remarkable sporting event in Slovenia. „I hope EPINT 2017 will contribute to the promotion of sports for the disabled and to the positioning of such sports as important sports in Slovenia. We hope that beacuse of such sporing events in Slovenia, more and more disabled will decide to engage in sports. We wish to find new athletes that will compete on the highest level. Organization of such an event is also a nice award and reward for Slovenia,“ said the ambasador of the tournament Mateja Pintar. „European championship is much more than just a traditional tournament. I believe that Laško will be visited by a great mass of people and supporters of para table tennis. It is a great challenge to prove yourself in front of the home audience,“ said Slovenian player Bojan Lukežič. „We will try to do our best. On home ground we will also receive enough support. The goal is a medal! Andreja and I will have to train even harder, to prove ourselves at the championship in doubles,“ added Slovenian athlete Barbara Meglič. „The biggest challenge will probably be the logistics in the sports hall. We will have to take care of the sound system and we are planning on an interesting accompanying program between breakes,“ said Roman Pungartnik, the member of the organizational team of EPINT 2017. Monday and Tuesday in Laško have been marked by team events at the 14th Slovenia Open Thermana Laško. However Slovenian team won't be playing today. Bojan Lukežič & Primož Kancler and Andreja Dolinar & Barbara Meglič ended the competition in the quarterfinals. We believe semi-finals and finals today (the start is at 9 am) will be filled with excitement and surprises. Today is also the last day of the tournament in Laško. Home team is happy that experienced Andreja Dolinar returned to the international scene. „I'm pleased, actually. I enjoyed every single game. I proved to myself that I can do it! There was also this feeling of desire and excitement in every game. The tournament is an excellent practice and motivation for European championship later this year,“ said Dolinar, the champion of the tournament in Laško in the year of 2004, which was the first year Laško hosted the event. „It wasn't easy, I was really nervous at first. It is a great victory for the whole team,“ said Swedish player Nicklas Thomas Westberg, who joined powers with Croatian athlete Pavao Jozić in class M7. „I'm so happy we won. It is my first time playing in the class M7, which is similar to my class M6,“ said Jozić, who came in Laško without his regular partner Vjeko Gregoričević. In the quarterfinals of class M8 British double Will Bayley&Bill Shilton defeated Hungarian double with 2:1. Hungarian athlete Gyul Istvan Zborai had to surrender the game against Shilton because of extreme back pain. „Hungarian team is very good, but we managed to win. And no we will only move forward. Maybe gold? Yes, we want it, but we will have a lot of trouble in the semi-final. We will be playing against excellent Swedish team,“ said Shilton, who also added that he likes coming back to the wellorganized tournament in Laško. There was also a lot of media interest for the tournament. Media reports about the tournament were seen on the national Slovenian TV and the biggest commercial television POP TV. Both were also present in the sports hall Tri lilije. Today's news reports will be filled with information about EPINT 2017, that will take place in Laško between 26th September and 5th May. The event will be introducet to the Slovenian journalist at the special press conference. The second day of 14th Slovenia Open Thermana gave us champions of single events. We were also celebrating success of Slovenian athletes. Home audience was happy for Bojan Lukežič, who managed to break through to the quarterfinals in class 3, and was then defeated by Argentinian athlete Copola with 1:3. Primož Kancler ended the competition in eight-finals. However, Kancler and Lukežič have high ambitions for tomorrow's team events – they will be playing against Canadian and Spanish team. „I am extremely pleased that I finished among the top eight in Laško. For me this is a great success and proof that we're doing something right. I am in better shape, my hand obeys me. I am looking forward to team events. Primož and I are silently hoping to win a medal,“ said Lukežič ambitiously. Single events brought many surprises. Two gold medalists from paralympic games in Rio didn't manage to win gold this time in Laško. Perić-Ranković lost in final of class 4-5 against Jordanka Abuawad. British athlete Bayley lost against Ukranian player Popov in semi-finals. Popov was defated by his teammate Nikolenko in the final. „I like coming back to Laško. The organization of the tournament is always excellent. It wasn't easy for me today. I expected that I would make it to the final. And in the end I won. My thoughts are directed to the World Championship in Slovakia,“ said Spanish player Alvaro Valera after the victory in class SM6. He is also a big fan of football team Atletico Madrid and supporter of their goalkeeper, Slovene Jan Oblak. „I train and practice a lot. I am so happy I won, this is a great incentive for the rest of the season,“ told us Russian athlete Elena Prokofeva after the victory in class SF11. „This is my first tournament after Rio. I can't say that I'm in top shape, I still have so much work to do. This year there will be two important events – World Championship in Slovakia (team) and European Championship in Slovenia (singles),“ said Ukranian player Viktor Didukh, who was extremely happy of the first place in class SM8. Ukranians won medals in four male categories in Laško. Team events started after the end of single events. Slovenian representatives in team events beside Lukežič and Kancler are Andreja Dolinar and Barbara Meglič, Ljubiša Gajič joined Kancler and Lukežič, Andrej Žnidar will be playing together with Croatian coleague and Luka Trtnik with Argentinian player. Team events are also the ultimate test for the most teams, who will take part in the World Championship in Bratislava, that starts in ten days. Second big event of 2017 will be European Championship, that will take place between 26th September and 5th October in Laško, Slovenia. 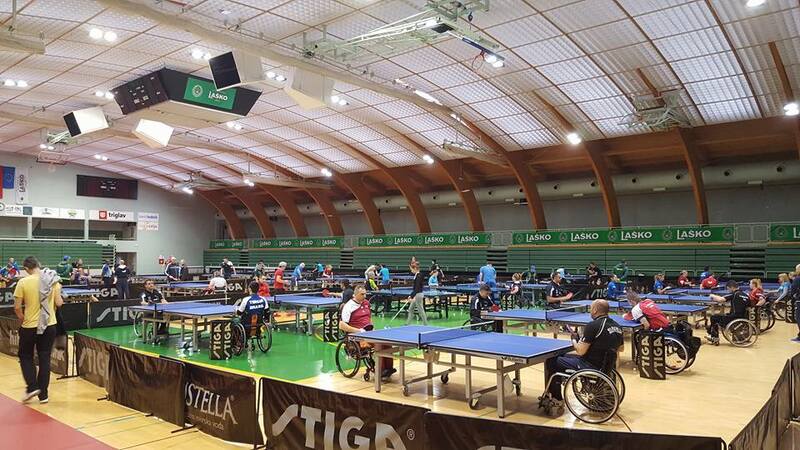 The first day of 14th Slovenia Open Thermana Laško, organized by the Sports Federation for the disabled of Slovenia – Paralympic Committee in cooperation with Slovenian Table Tennis Association, has come to an end. Slovenian team has many reasons for celebration after the first day – Primož Kancler, Bojan Lukežič and Ljubiša Gajić advanced to the second round. However, Andreja Dolinar, Barbara Meglič, Andrej Žnidar and Luka Trtnik did not, but the latter impressed the audience and announced better times. Kancler and Lukežić will continue tomorrow, Gajić has already said goodbye after the defeat against Boury from France. „No surprises on the first day – all favorites justified their title and made it in to the elimination round. Athletes proved that they are even more prepared than last year. The level of games has raised again,“ Gorazd Vecko, professional manager and coach of the British team, praised the competitors. „Part of the event was also attended by Darko Jogić, an excellent Slovenian table tennis player, and he was impressed,“ added Vecko. Laško was also visited by Edvard Vecko, who won six medals at World and European Championships in his career and is considered the most prestigious Slovenian table tennis player. We are expecting a spectacular event on Sunday, that you'll be able to witness between 12:45 and 3:00 pm. We will be boradcasting the event live on the YouTube channel of the Sports Federation for the Disabled of Slovenia – Paralympic Committet (https://www.youtube.com/channel/UCjSxVySND0aWTkisWbbs9tQ). „I started great, I lost 2:3 to 16th in the world. It was fenomenal. We were all so pleased. Second game was harder. I played against experienced athlete from Japan and it didn't go well. Overall, the tournament is an important steppingstone for me,“ said talented Slovenian athlete, Luka Trtnik. „Luka has shown significant progress. He is more focused and psychologicaly prepared. I am sure that in few years he will be at the very top of the table tennis world,“ said the coach of the Slovenian team, Damijan Lazar. „I think the organization and the competition as such are going as planned. We are in touch with the world's top. Kancler showed psychological stability, Lukežič has a chance of breaking through,“ said Lazar, whose thoughts are already focused on Sunday – Kancler will be playing against Romanian athlete Dirleo (10:30 am). An hour before Kancler will be playing against Jordanian player Abu Jamej. ​Laško – Center of the World for few days! In Laško everything is ready for the start of the 14th Slovenia Open Thermana Laško tomorrow on 6th May. 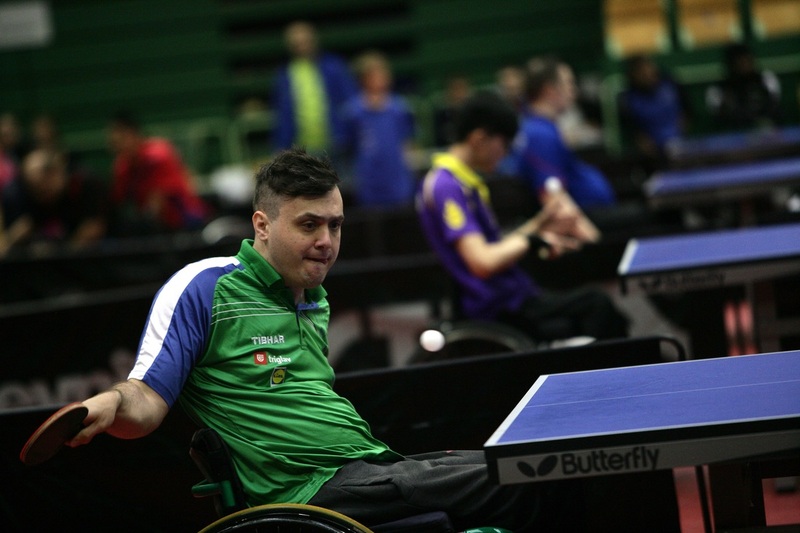 The tournament is organized by the Sports Federation for the Disabled of Slovenia – Paralympic Committee of Slovenia in cooperation with Slovenian Table Tennis Association. The tournament in the town by the river Savinja is considered one of the biggest tournaments of the highest quality in the world. „I think we have done everything that was in our power. I am certain that competitors will feel good in Laško nad that they will be reaching for good results,“ said Damijan Lazar, the president od the Sports Federation for the Disabled of Slovenia – Paralympic Committee of Slovenia before the start of the tournament. The last piece of special flooring (so called taraflex) will be placed in the Sports Hall Tri lilije today. The organizer has also provided new tables for 323 competitors from 41 countries. In the last four days seven teams have already practiced in Laško as part of the training camp that was organized by Slovenian expert and leader of the British team Gorazd Vecko. The draw for single events will be conducted today at 9 pm. Slovenia will be represented by Andreja Dolinar, Barbara Meglič, Luka Trtnik, Bojan Lukežič, Ljubiša Gajič, Andrej Žnidar and Primož Kancler. „Our team had some quality training sessions at Vecko's training camp. This tournament will be a good indicator of the progress of young and promising Luka Trtnik, who increased the scope of training sessions for the sake of the tournament. I would also like to see how well will do Bojan Lukežič and Primož Kancler. The tournament in Laško will be the last test before the World Championship of doubles in Bratislava,“ told us Lazar, who also trains Slovenian team with the help of coach Darko Kojadinovič. 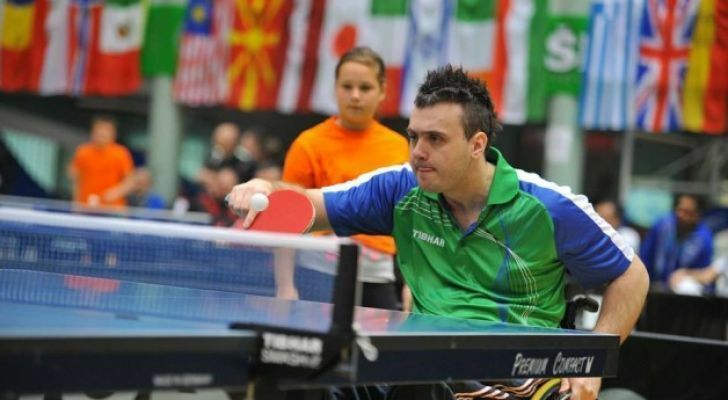 Slovenia has a nice tradition of the para table tennis tournament organization. This year's tournament is 14th in the row and many times we celebrated success of Slovenian representatives. At first the tournament was organized by the Association of Paraplegics of the Province of Ljubljana. The organization of the tournament was in hands of Gorazd Vecko and Gregor Gračner. Between 28th April and 2nd May of 2004, 176 competitors from 21 countries took part in the tournament in Laško. The best were the French who won 25 medals (10 gold, 11 silver and 4 bronze medals). In the same year our presentative Andreja Dolinar won two gold medals – one in single events and another in team events with Mateja Pintar, who also won bronze in single events. This year's Slovenia Open is for the organizing team also an important rehersal for this year's European Para Table Tennis Championship EPINT 2017, which will also take place in Laško between 26th September and 5th October 2017. The ambassador of the championship will be Mateja Pintar, former Slovenian paralympic table tennis champion (and the winner of bronze paralympic medal), who will also visit Laško in the next few days. We will again make sure that you will be promptly and effectively informed about the tournament. 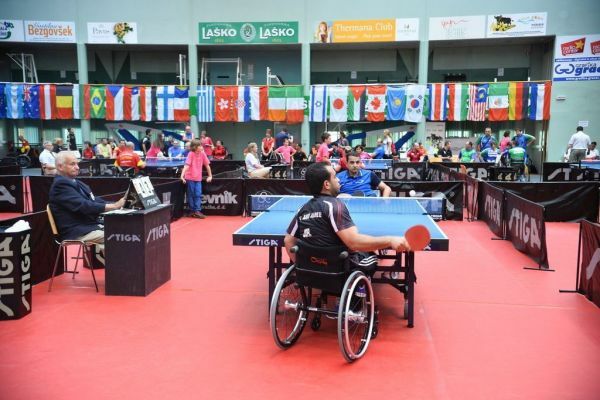 For Sports Federation for the Disabled of Slovenia – Paralympic Committee the year of 2017 will be marked by table tennis events. Two globally notable events will take place in Laško: in May we are hosting the biggest table tennis tournament in the world – the 14th Thermana Laško Slovenian Open Championship, and in autumn european championship EPINT 2017 will also take place here in the small town by the river Savinja. According to the latest data 323 athletes from 41 countries will take part in the tournament in May. Single and team events will be judged by 78 judges. The tournament will take place in the Sports Hall Tri lilije between 6th and 9th May. First two days are reserved for single events and the last two for team events. „We appreciate that so many athletes are coming back to us for the 14th table tennis tournament. 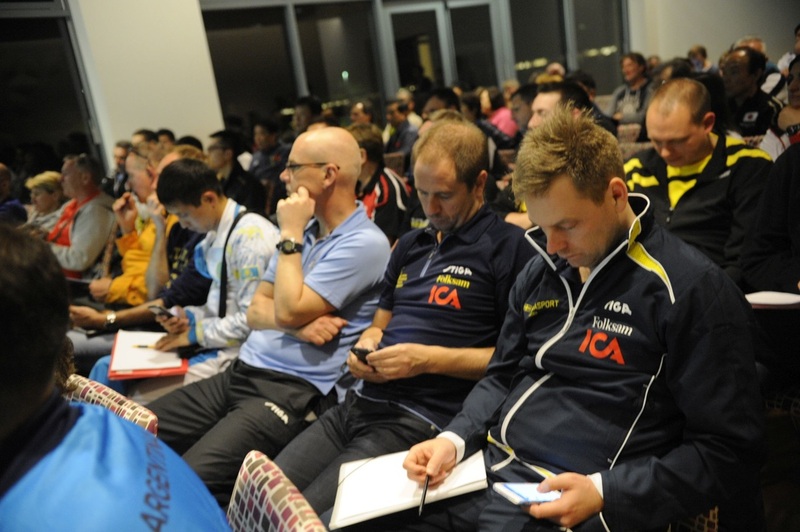 We will be hosting more than 320 professional table tennis players from 41 countries. This year we will even meet twice in Laško: first, at the 14th international tournament for disabled and second, at the prestigious table tennis event for disabled athletes – at the european championship. We've already organized european championship 10 years ago. This year we will again try to do our best and organize an event of highest quality,“ said the president of the Sports federation for the Disabled of Slovenia – Paralympic Committee, Damijan Lazar, before the tournament. Slovenia will be represented by Andreja Dolinar, Barbara Meglič, Luka Trtnik, Bojan Lukežič, Ljubiša Gajič, Andrej Žnidar and Primož Kancler. „This year Slovenian athletes intensified their readiness before the tournament in their home country. Slovenian representative team has just returned from preparations in Croatia. We can expect agressive game from our athletes and we will see if that's enough to achieve good results. We are betting on young Luka Trtnik, who raised his game on the impressive level through tough training process,“ commented Damijan Lazar on his team. „I am so happy that I'm in good health. I've been training since last November and I eagerly take care of my physical condition. Because of some problems in the past two years I wasn't in the competitive form. Last year I competed only to see if I still possess the desire to compete. The desire still exists and I'm looking forward to compete in Laško,“ said experienced Andreja Dolinar. „In Laško I would like to make a step forward. I'm focusing all my thoughts on the competition. If I'll be satisfied with my game, my coaches will be happy too and hopefully the results will be good, too,“ said Luka Trtnik before the tournament in Laško. The tournament's Manager is once again Gorazd Vecko, the coach of the British table tennis team. Vecko remains true to his practice – he will again gather representatives of foreign teams, who will take part in strong preparatory camp between 1st and 5th May. 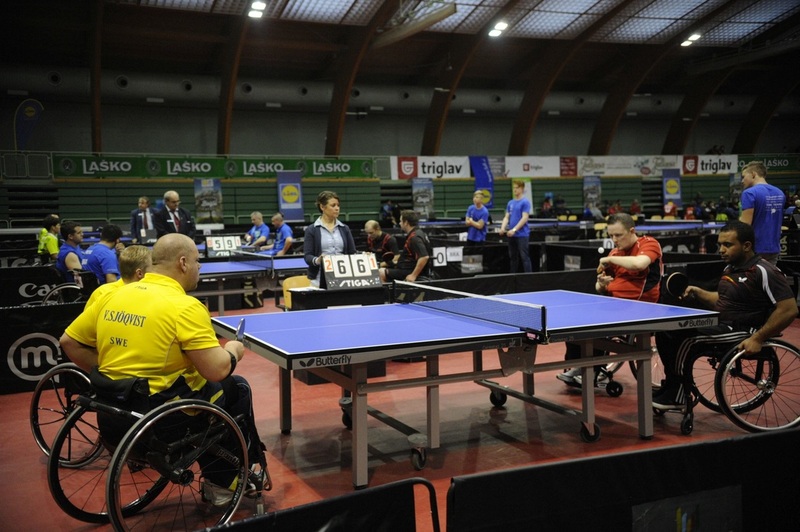 The biggest table tennis torunament for the disabled has ended with the closing ceremony in Laško. 315 athletes from 43 countries took part in the 13th Slovenia Open Championship Thermana Laško. The Chinese were the most successful - they won 14 medals! Home crowd was impressed by Luka Trtnik and Primož Kancler, who was the only one from Slovenian team who fought his way through to the eliminatory round in single events. „We are happy that another exemplary tournament has successfuly come to an end. We made it! We did a good job. The level of the games was high. At this point I want to thank Thermana Laško, Brewery Laško, all volunteers and the organizational team. We will see you two times next year - in May we will host the 14th open tournament and in autumn of 2017 we will host the european championship,“ said Damijan Lazar, the President of the Sports Federation for the Disabled Slovenia - Paralympic Committee, at the end of the tournament. „I am sure you will keep Laško and Slovenia in your hearts. Not only because of the medals, but also because of the local hospitality,“ said dr. Boro Štrumbel, the general director of the Directorate for Sport at the Ministry of Education, Science and Sport, in his welcome speech. He also brought greetings from the Minister dr. Maja Makovec Brenčič (Ministry of Education, Science and Sport), who was the general sponsor of the tournament. Marjan Hribar, the President of Slovenian Table Tennis Association, praised the tournament and commitment of those involved. The closing ceremony was moderated by Aleš Sečnik. The crowd was impressed by the dancers of PK Zebra and group Maestro. 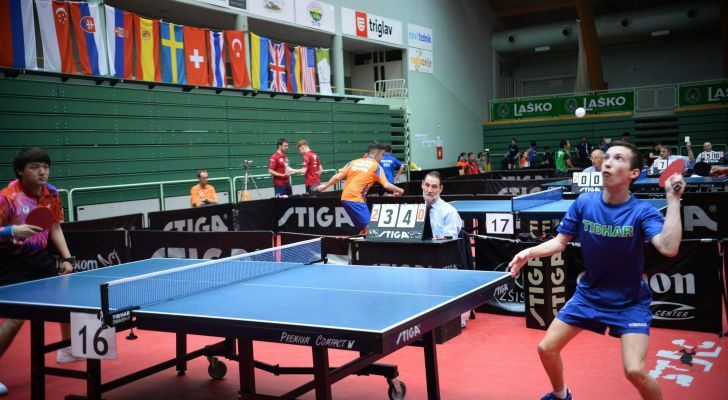 „This was the strongest table tennis tournament in Laško so far. It will be difficult to repeat such a success. In few days we witnessed miniature Paralympic Games. 17 champions from London 2012 took part in the tournament. Single events haven’t gone by without some surprises. But in team events the Chinese proved that they are extremely powerful. The rest of the world will have to work hard to be on the level of Chinese players. Chinese have many equaly strong competitors, while other teams don’t,“ said the director of the tournament Gorazd Vecko, who is also the leader of the British team. Chinese won five medals in single events. Champions among women in single events are: Polish Dorota Buclaw (W1), Italian Giada Rossi (W2), Swedish Anna-Carin Ahlquist (W3), Serbian Nada Matić (W4), Chinese Bian Zhang (W5), Croatian Sandra Paović (W6), Dutch Kelly Van Zon (W7), Chinese Jing Dian Mao (W8), Chinese Li Na Lei (W9), Chinese Qian Yang (W10), Ukrainian Natalya Kosmina (W11). Champions among man in single events are British Robert Davies (M1), French Fabien Lamirault (M2), German Thomas Schmidberger (M3), Turkish Nessim Turan (M4), Chinese Ningning Cao (M5), Spanish Alvaro Valera (M6), British Willam John Bayley (M7), Ukrainian Viktor Didukh (M8), Belgian Laurens Devos (M9), French Mateo Boheas (M10) in French Lucas Edouard (M11). Women’s team events ended as follows. Italian team was the best in the combined group 1-2. Chinese won gold in classes 3, 4, 5, 8, 9 and 10. Combined Dutch and Turkish team won in combined group 6-7. Polish team won in group 11. Combined German and Swiss team won among men in group 1. French team won in group 2, Polish in group 4, Croatian in group 6, gold in group 7 went to Spain, Ukraine won in groups 8 and 9, combined Australian and Spanish team won in group 11. Chinese male teams won in groups 3, 5, 10. „Every medal is welcome. It proves you’re doing something right. Gold from Laško is an excellent incentive for Paralympic Games in Rio, where I’m going as number 1 in my group,“ told us German player Thomas Schmidberger, who also praised the organization of the tournament. Spanish Alberto Seoane Alcazar is in Laško for the fifth time and he won his first medal here. „The competition was really tough. Therefore, the medal is even more important. I am happy,“ said the Spanish athlete. „I’ve known no defeat for three years now. And I always love to come to Laško. I won again, I am on the right way. There are few months left until Rio and I am going there to win gold,“ said Croatian Sandra Paović before the end of the torunament. Slovenia was represented by Andreja Dolinar (W4), Barbara Meglič (W4), Ljubiša Gajič (M2), Bojan Lukežič (M3), Ivan Lisac (M3), Primož Kancler (M3) and Luka Trtnik (M7). In single events only Kancler advanced to the second part of the competition, but unfortunately said goodbye in eight-finals. „Such results were expected. Unfortunately our team experienced many health problems in the past. We hope the future will be better. However, Luka Trtnik has shown a visible progess,“ said Damijan Lazar about the performances of his team. The competition took place in Tri lilije sports hall. The new elevator in the hall made everything easier for contestants and organizational team. The access to the hall was easier, faster and safer. Thermana Laško, municipality of Laško and Brewery Laško contributed the funds for the new elevator. Single events at the 13th Thermana Open tournament in Laško are over. Five gold medals go to China. Most of the favourites proved that they are in an excellent shape before Paralympic Games in Rio that will take place four months from now. Team events started in the afternoon. In the morning home crowd applauded Slovenian player Primož Kancler, who came among the top 16 in the group, but unfortunately he then lost against Thomas Brühle. The crowd welcomed the victory of Sandra Paović from Croatia who remains undefeated for the third year. „I love coming back to Laško, this hall suits me. I am really happy I won. And in Rio, well I want to win gold medal,“ told us the excellent Croatian player. Anna-Carin Ahlquist also proved that she is in excellent shape - in quarterfinals and semifinals she defeated Chinese players. "It was an amazing game. I was so happy I was able to reach the final. The competition is so tough, here are all the best players in the world. I got to play against all of them. The tournament is such an important milestone on the way to Rio. I am so happy to be here and so happy that all this great players are here,“ told us Ahlquist, who was genuinely happy. „You have to fight for every point, you really have to focus and be concentrated all the time. My biggest wish is of course to win gold medal in Rio. I know it's going to be really tough but I will try my best and continue with my preparations at home," she added. Dutch Kelly Van Zon also easily won. German player Thomas Schmidberger won against Chinese Feng. "I am very happy with the tournament so far. I only lost two sets in the singles so the first part of the tournament was excellent. I try to do my best all the time in every match and in the end I will see what it brings. This tournament is perfect. It is a good preparation for Rio. Here are many players from many countries, also the best ones. I will concentrate on the team event now, with my partner and try to give my best,“ said Schmidberger. On the way to gold medal William John Bayley of the British team defeated numbers 4, 3 and 2 from the world ranking. Slovenian press is devoting a lot of attention to events in Laško. The journalist of newspaper Večer interviewed the president of the Sports Federation for the Disabled of Slovenia - Paralympic Committee Damijan Lazar and the team of the Sports Federation for the Disabled of Slovenia - Paralympic Committee continued filming the documentary film about the tournament. The champions among women (single events) are: Polish Dorota Buclaw (W1), Italian Giada Rossi (W2), Swedish Anna-Carin Ahlquist (W3), Serbian Nada Matić (W4), Chinese Bian Zhang (W5), Croatian Sandra Paović (W6), Dutch Kelly Van Zon (W7), Chinese Jingdian Mao (W8), Chinese Li Na Lei (W9), Chinese Qian Yang (W10), Ukrainian Natalya Kosmina (W11). The champions of single events among men are: British Robert Davies (M1), French Fabien Lamirault (M2), Nemec Thomas Schmidberger (M3), Turkish Nessim Turan (M4), Chinese Ningning Cao (M5), Spanish Alvaro Valera (M6), British Willam John Bayley (M7), Ukrainian Viktor Didukh (M8), Belgian Laurens Devos (M9), French Mateo Boheas (M10) and French Lucas Edouard (M11). 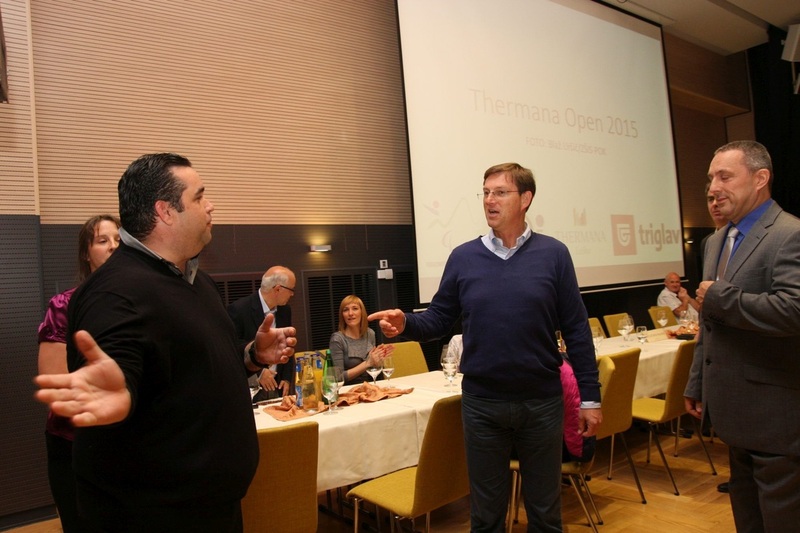 The first day of the 13th Slovenian Open Championship Thermana Open has ended. Table tennis enthusiasts have witnessed a number of quality matches, but the real treat is in store for them today. Nevertheless, even the preliminary round was full of surprises. British Kim Daybell was in SM10 better than former world champion Yang Gea. Billy Shinton, also from Great Britain, won against Gyulo Zborai from Hungary in SM8 with 3:2. In SM5 Turkish player Ali Ozturk defeated world champion Tommy Urhaug (Norway) with 3:0. Surprisingly, three Chinese players were eliminated from single events on the first day of the tournament (Xingyuan Guo in SM5, Churen Sun in SM8 and Shuo Yan in SM7). Slovenian honor was saved by Primož Kancler, who was the only one of the Slovenian team that broke through to the second round. In Eighth-finals on Thursday he’ll play against German Thomas Brüchle. After more than a year long abscence Andreja Dolinar is back, but she unfortunately lost two times with 2:3 and said goodbye to the competition. Luka Trtnik definetly gained many new experiences. On Thursday afternoon (after 4 pm) team events will start in Tri lilije sports hall. The draw was done yesterday afternoon by the leadership of Thermana Open. The media production team will start with filming of special documentary about the happenings in the tournament. Let the rehearsal for Rio begin! The 13th Championship Thermana Open starts in Laško on Wednesday with the opening ceremony at 8.45 am. 315 contestants will start competing at 9 am in Tri Lilije sports hall. The new elevator in the hall will make everything easier for contestants and organization team. 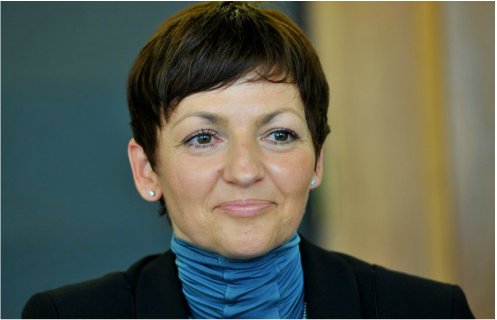 Keynote speakers at the opening will be Mojca Leskovar, the CEO of Thermana Laško, and Gorazd Vecko. Technical meeting took place in Thermana Laško on Tuesday night and it was led by the director of the tournament Gorazd Vecko. Initially he thanked all for participation on the tournament. The leadership of the championship set the ground rules and the draw was done in the end. Slovenia is hosting the tournament for the 13th time. The traditional training camp again took place in Laško one week before the competition. The tournament has a very good media support. The day before the start of the championship Laško was visited by the Slovenian national TV and central regional TV Celje. Even many radio stations keep track of the tournament - Val 202, Radio Celje, Štajerski Val, sports journal Ekipa and other Slovenian web portals. The tournament in Laško will officialy opened on Wednesday morning, the draw for the singles will be done on Tuesday, doubles will be known around 9 pm. Single events will take place on Wednesday and Thursday, team events on Friday and Saturday. The tournament will end with ceremony on Saturday evening in Thermana Laško. ​Due to the strong world competition Slovenian athletes don’t have many oppotrunities for winning good results. Attention will be directed towards young Luka Trtnik, who is bravely integrating into international table tennis program and is gaining experience for his further table tennis career. Slovenia will be represented by Andreja Dolinar (W4), Barbara Meglič (W4), Ljubiša Gajič (M2), Bojan Lukežič (M3), Ivan Lisac (M3), Primož Kancler (M3) and Luka Trtnik (M7). The Chinese are also coming to this years tournament. „Everything is ready for the strongest tournament in the world,“ says Gorazad Vecko, the director of the tournament and the leader of the powerful British team. It is clear that Thermana Open will be an excellent test on the way to Paralympic Games. Tournament is famous for its good organization and this is definetly one of the reasons for such a massive participation. „The directior of the Chinese team invited the British team on preparations but in the end we decided that the Chinese team comes and takes part in the tournament in Laško,“ said Vecko proudly. „I don’t know if we are really aware of what this means. The Chinese are powerful and the only tournament they are participating in abroad is Thermana Open,“ added Vecko. ​315 comptetitors from 43 countries will participate in the championship. „We are extremely glad that world is coming to us in such numbers and helping us create sports surpluses. This year we will be able to see the best table tennis players in the world. We believe we are organizing the biggest and strongest international table tennis competition for the disabled before the Paralympic Games in Rio 2016. Special thanks goes to Thermana Laško, who together with municipality of Laško and Laško Brewery found means to build a new elevator for safer and faster access to the Tri Lilije sports hall. We wish our sporting events will be visited by many young people who will experience the beauty of sport and recognize it as the bridge of socialization,“ said the President of the Sports Federation for the Disabled of Slovenia - Paralympic Committee of Slovenia Damijan Lazar. ​Since friday Laško is holding a preparatory camp led by Gorazd Vecko. Under his watchful eye teams from Slovenia, Slovakia, Brasil, Israel, Great Britain, Norway, Croatia and Ireland are getting ready for the tournament. 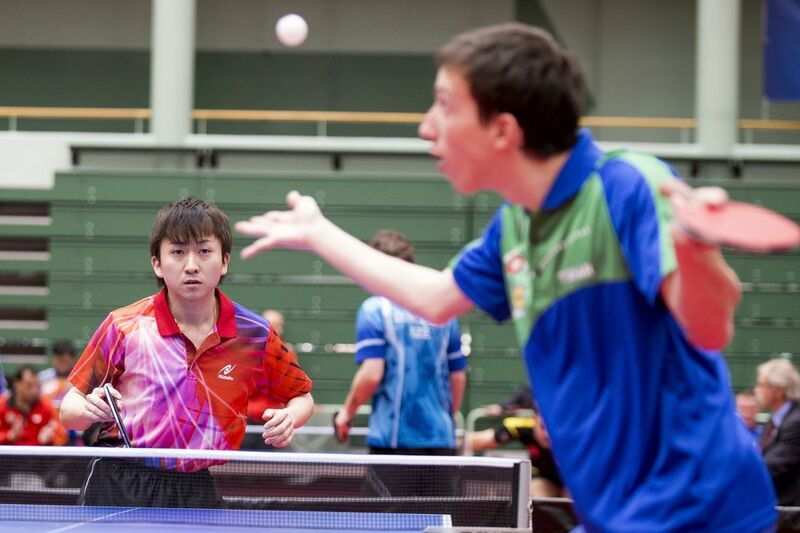 Vecko is glad that young and excellent Slovenian table tennis player Darko Jorgič is helping as sparing partner. Jože and Andreja Urh also visited training camp in Laško. Laško is ready for the 13th open championship Thermana Laško - international table tennis tournament for the disabled. Honorary sponsor of the tournament is dr. Maja Makovec Brenčič, Minister for Education, Science and Sport.